At Public Books, Damon R. Young interviews gender studies icon Jack Halberstam. The interview convers Halberstam’s early intellectual formation as a Victorian scholar, and touches on new themes that have taken center stage in his recent work, such as wildness and the concept and political practice of anarchism. Check out an excerpt below. DRY: Along with wildness, you have been writing recently about anarchy. I want to ask, what is the political vision there? Because I know that you’re also someone who is interested in the politics of resistance and how we should orient ourselves in relation to a newly dystopian set of conditions. Is anarchy a real political possibility or a conceptual figure? JH: I think that anarchy is a critical concept that has recently been revived in relation to our current set of cascading political crises. Because people have a deep distrust of the state at this point and no longer believe that the state will step up to regulate markets or make any attempt to redistribute wealth or combat white supremacy or guarantee health care or education, then we might legitimately ask whether a state-centered political system actually works. Many theorists have turned recently to anarchy in their work: Fred Moten and Stefano Harney do so in their brilliant manifesto for The Undercommons. Saidiya Hartman uses the concept of anarchy to describe the political rebellions of black girls in the early 20th century, and she introduces the notion of “waywardness” to describe their palpable refusals of criminalization, domestication, and social morality. Some of Tavia Nyong’o’s work on critical fabulation has an anarchist bent, Jayna Brown’s work on women of color in punk and her new work on Black speculative fiction engages anarchy, and Macarena Gómez-Barris’s new work on indigenous activism in the face of extractive capital also looks to queer and feminist anarchism for alternative formulations of the political. And so on. In a way, the contemporary anarchist does not seek to make life better under the current conditions of exploitation and extraction, but tries, rather, to figure out how to bring things to the point of collapse. Because the system itself is what must be opposed—a representative democracy within which only rich, white people are represented. A legal system within which the law preserves the rights of the exploiters. A medical system in which the rich get treatment and doctors deal drugs, and poor people die “prematurely,” as Ruth Wilson Gilmore puts it. I am not a political theorist—duh!—but I do think that this is an interesting moment to think beyond state-oriented democratic politics. 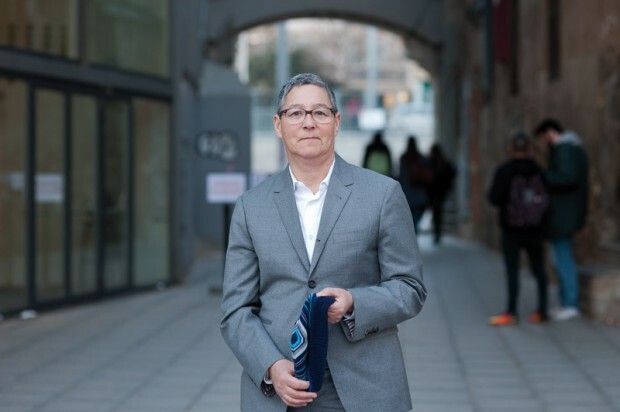 Image of Jack Halberstam via lameva.barcelona.cat.